It all started in June 1685 when the exiled Duke of Monmouth--the illegitimate son of Charles I--landed at Lyme Regis to claim the throne from the unpopular King James II. He soon rallied a band of 5000 supporters. Eleven regiments of foot (infantry) were quickly raised to oppose him. One of these, raised by the Earl of Bath, the Governor of Plymouth, was known as the 10th Foot, or the Earl of Bath's Regiment. With the crisis over, some of the newly-formed regiments were disbanded, but the 10th Foot were retained. 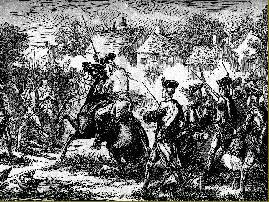 Some of the men were armed with muskets, some had swords and the bayonet soon replaced the pike. 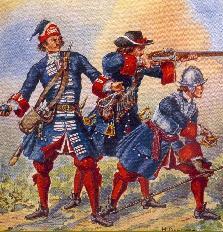 A grenadier, musketeer and pikeman of the Tenth Foot. 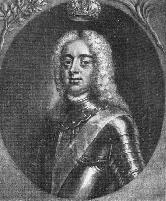 In 1688 Prince William of Orange landed at Torbay to seize the throne. The Earl of Bath and his regiment decided to support him. Shortly after King James II heard this news he fled to France. And so the regiment which had been formed to protect King James played a large part in deposing him! Orange (now King William III) in his campaigns against the French King Louis XIV. They were in a brigade led by General John Churchill, Winston Churchill's ancestor. They won their first battle honour at Steenkirk in Belgium in 1692. When William III died Churchill became Commander-in-Chief of the army and the 10th Foot took part in his historic victory at Blenheim, on the Danube, The war dragged on until 1712. In 1730 the 10th Foot were sent to garrison Gibraltar. They stayed there for 19 long years and were then posted to Ireland. 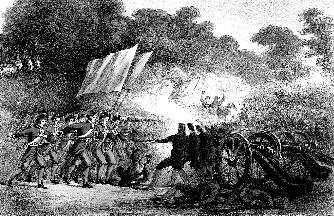 The Battle of Steenkirk, August 1692. Problems started to arise in the American Colonies and the 10th Foot were sent from Ireland to America in 1767. It was only a matter of time before there was armed conflict. In 1775, the Tenth were sent to Concord, about 18 miles from Boston, to destroy some stores which the Americans had collected. At Lexington, they came across some American militia who refused to lay down their arms. Several opened fire and a soldier of the Tenth was injured. This was the first blood to be shed in the American War of Independence. More troops arrived from England and the Tenth moved north. They were in action at Long Island, Brooklyn and Rhode Island before being sent to Philadelphia. Casualties and illness took their toll and in October 1778 what remained of the 10th Foot returned home. Whilst in America the regiment were given the nickname "The Springers" because (so it's said) of their speedy footwork! The 10th Foot had no connection with Lincolnshire until 1782, when all infantry regiments took on county titles to promote recruiting. They were now known as "The Tenth or North Lincolnshire Regiment". The Tenth were shipped to Jamaica in 1786. In those days it was a very unhealthy place and many men died from yellow fever. In 1795 the 10th Foot were recalled and were stationed at Lincoln for the first time. Recruiting parties went into the county to enlist local lads. The uniform at the time of the American War of Independence in 1776. The 10th Foot now wore red uniforms like the rest of the army.